Ryemilan's Ramblings: Bright Colours to Warm a Cold, Rainy Day! Just thought I'd jump on here and post a little pic of another bracelet that I made a few weeks back. These beautiful lampwork beads are by Marie of Bleu Verre on Etsy. I love the combination of bright, fun colours and even looking at the picture is making me smile on this cold and wet day. The orange and pink go really well together and look great with the metallic touches. I have used Swarovski crystals in Crystal and Greige colours (Greige being a smoky grey colour with a hint of brown in it). Well, that's all from me. Hope you are managing to stay warm and dry. PS. Is anyone else hanging out for the big Lost finale tonight? I am so going to miss all of those characters and those kooky occurrences on that crazy (but beautiful) island. (Blogged to: Message in a Bottle - The Police and Dreams - Van Halen). So pretty Sam! The colours are just lovely! I can't wait for lost lol! Hahaha - you have me humming message in a bottle now - LOL. But as always your beadwork is STUNNING! LOVE the bright, warm colours! 'Thanx for the cake hints too! It's been too long between chats. I've nominated you for a beautiful blogger award. Thanks for all your inspiration & friendship. You can collect the award from my blog. ....& oh my goodness, this bracelet is fab & definitely adds lots of warmth to a chilly day. Hee hee - I'm humming Message in a Bottle too! 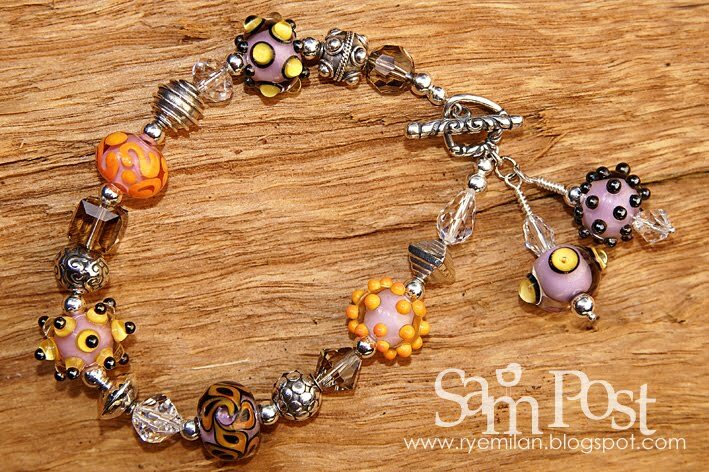 Gorgeous bracelet - love the warm colours - esp. the greige! I just love stopping by to see what jewelry you've made. The beads you find are so cool. Love these colors! Wow, Sam! Your jewelry creations are always amazing.